The officer in charge of policing the wedding of the Duke and Duchess of Sussex says it is "only a matter of time" before another UK terror attack. 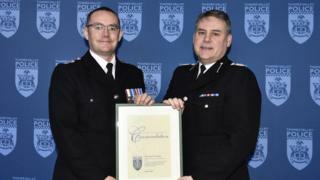 Ch Insp Pete Dalton said complacency over the current threat from "low-sophistication" attacks was a "real-risk". He added the "low-complexity attacks" involved terrorists using vehicles, knives, firearms or explosive devices. A total of 18 terror plots have been disrupted in the past two years. Ch Insp Dailton, of Thames Valley Police, said the threat had "definitely morphed into that low-sophistication, low-complexity, vehicle-as-a-weapon attack, edged weapon, explosive device, firearm or combination of those". He added: "There's still lots of work to be done and sadly it's only a matter of time before another incident happens." The senior officer also warned there was a "real risk" of complacency in terms of force budgets and a "risk in terms of mindset". He added it was "extremely challenging" to secure funding for vehicle barriers in Windsor until the Westminster Bridge attack in March 2017. The installation of anti-terror barriers around Windsor Castle was announced in January after locals complained the existing ones were "ugly".